Light is the first thing to go as we near the year's nadir, the days dimming earlier and breaking later. The dark is truly rising. So as Advent approaches, flip every switch in the house, break out the blankets and steel yourself to outlast the gloom. But in all your preparations, pause for a moment, just long enough to peer up into a firmament black and cold as flint. See the frosty flecks of stars? 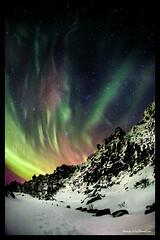 See how the borealis coils its frigid fire around them, eldritch and writhing? What speech do they pour forth to us, and what unearthly knowledge do they show night after endless night? Come, come. Don't be shy. Tell us: What did they say to you? 1.) If you want to contribute, email ISawLightningFall [at] gmail [dot] com. 2.) Write a spooky piece of flash fiction exactly 100-words long -- no more, no less. 3.) Post your story to your blog on December 22 and email the link to me. (Please note that this is a different date than previous years, primarily because I fear my family will consume me utterly should I spend another Christmas Eve linking to all your delightful horrors.) Hosting can be arranged for those who don't have their own blogs. Another thing for the newly initiated: Although this event has the word "ghost" in its title, you do not necessarily have to write a ghost story. Sure, some folks like to pen stories where things go bump in the night. But others prefer tales where slavering horrors crouch just beyond the firelight's throw, waiting for the embers to die. Others love eerie SF or grim noir or unusual takes on traditional religious stories. Heck, a few even enjoy the literary stuff. Genre matters less than tone. So write what you want, just make sure it causes our neck hairs to rise. Why not check out our 2009, 2010 and 2011 events while you're at it? Just be careful: Ghosts often appear in the most unexpected places. I put this in my sidebar and I'm sure I'll participate. You're awesome, madam. Many thanks. I look forward to this every year. Glad you're onboad. Sounds wonderful! I'll do my best to participate. This meditation on commercialism, idolatry, wealth, innocence and judgment seems like a nice setup for a delightfully post-apocalyptic Christmas.